This unusual dark red mirror is still used in palaces and hotels in Morocco. 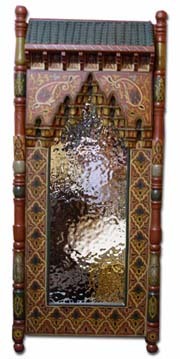 This hand painted and handmade mirror will give a special look to any home decor, great work and great quality. The mirror measures 73" high x 32" wide. Custom order is available also. If you have any question, please email us or call us at 727 251 4803.